This is one of the great things I'm going to be writing about on my blog. Almost every day, I am going to post the outfit I'm wearing and information about it! Today I'm wearing a wool sweater with a tiger tee-shirt. 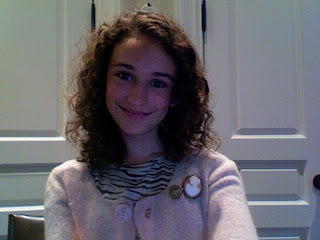 If you noticed I have on some gorgeous brooches. The smaller gold brooch I made out of an antique button and a brooch back. The other one is also an antique, it was made especially for a woman and her face is carved on to it.